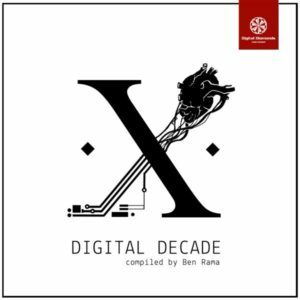 Digital Diamonds is proud to present Digital Decade, an ambitious release celebrating ten years of activity in the underground electronic music scene. Compiled by Ben Rama, this release features 10 exceptional remixes of memorable tracks from the label’s extensive back catalog, expertly crafted by Digital Diamonds artists past and present. As one of the scene’s most active proponents of psychedelic techno it is no surprise to find this style strongly represented here. Alongside several more progressive-leaning tracks that don’t shy away from melodies, this well-round release will appeal to fans from across the spectrum. Mastering by Sonic HQs Freiburg, Germany, with artwork by Tim Schienke. MP3 Download | FLAC Download | WAV Download · Download count: 21,809. Wie immer ein Diamant ! Wooww.. This album really fulfilled my expectations! Thank you. Very nice VA! Big thanx to musicants, remixers and publishers!!! Ben Rama must be a remote relative to Ken Sama! Yeah one more awesome release by Digital Diamonds! Digital Decadence, very good tittle.